HP80 was the first business calculator from HP. Display uses scientific notation, 10 digits mantissa, 2 digits exponent, red LED. Has functions for business and finance calculations, such as compound interest. 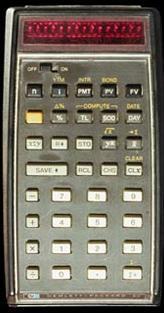 Launched in February 1973, the HP-80 was HP’s second handheld electronic calculator and its first business model.